Along with an editorial from editor Andy King, the Spring 2009 Issue of the Kenneth Burke Journal contains the following new essays: Benedict Giamo “The Means of Representation: Kenneth Burke and American Marxism”; Cem Zeytinoglu “Ad Verbum Purgandum or Literally Purgation”; David Gore “Attitudes Toward Money in Kenneth Burke’s Dialog in Heaven Between The Lord and Satan”; Carlnita P. Greene “Early Disaster Cinema as Dysfunctional “Equipment for Living”: or How We Learned to Stop Worrying and Love Kenneth Burke”; Tara Lynne Clapp "Social Identity as Grammar and Rhetoric of Motives: Citizen Housewives and Rachel Carson’s Silent Spring.”; Carly S. Woods "Everything is Medicine": Burke’s Master Metaphor? 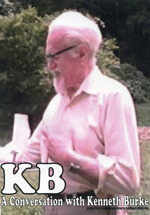 "; & Ian Hill, "“'The Human Barnyard' and Kenneth Burke’s Philosophy of Technology." The issue also contains book reviews of Burke, War, Words and Kenneth Burke on Shakespeare, as well as a closing essay by editor Andy King.